Laura Marano cutely scrunches up her nose during her appearance on Good Day New York on Wednesday morning (February 4). 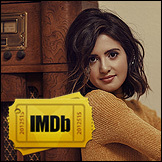 The 19-year-old actress is making her rounds, promoting her upcoming DCOM, Bad Hair Day, which is just two weeks away from premiering on Disney Channel. “It’s a GREAT day in New York at #GoodDayNewYork!” Laura joked on Twitter after her appearance, where she also posed with some animals from Staten Island Zoo.